The original Green Book was a guide book containing reviews of establishments in America’s Deep South in the 1960s likely to welcome black travellers. It features in Peter Farrelly’s telling of the story of Dr Don Shirley’s (Mahershala Ali, Moonlight) concert tour of the deep south in 1962. Being a black man braving a journey into potentially hostile territory, he hires a driver who doubles as a bodyguard in Tony ‘Lip’ Vallelonga (Viggo Mortensen, A History of Violence). Vallelonga is a tough Italian-American nightclub bouncer who takes the job after the club he works for is unexpectedly closed for two months but is persuaded to take the well paying job as Shirley’s driver. Vallelonga has his own racist views challenged during the trip where he witnesses some of the treatment meted out to his employer who is himself like a fish out of water. Shirley cuts a lonely figure, a talented and educated concert pianist mixing in high society without being able to fully participate due to the colour of his skin and his own place in 1960s society. Always well turned out, in fine, expensive clothing, he drinks heavily each night, unable to make connections with working class people like Tony, and ultimately to the very people he is being paid to entertain – he has a story arc of his own. There’s been a lot written about the glossing over and smoothing out of certain elements of the story, which are largely seen from the point of view of Vallelonga rather than Shirley, with Oscar season on the horizon. The two make for an odd couple as they journey through the Deep South but what could have been a very functional story is lifted by two fantastic central performances by Ali and Mortensen on their way to becoming friends. 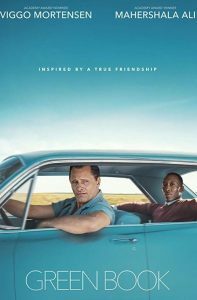 There’s plenty to like about Green Book and it’s easy to overlook the slightly paint by numbers script based on the true story and instead enjoy two actors at the top of their game. Summary: GREEN BOOK is a drama in which an Italian-American takes a job as driver to a black pianist on tour through the Deep South. This entry was posted in Shooting The Breeze and tagged film review, Green Book. Bookmark the permalink.